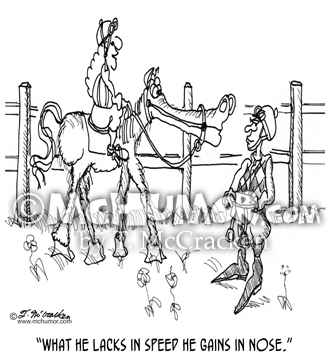 Horse Cartoon 1472: A woman saying of a horse with a REALLLLLLLY long muzzle, "What he lacks in speed he gains in nose." 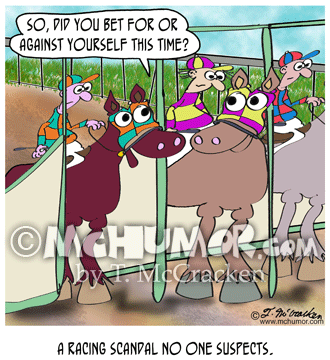 Horse Cartoon 8844: A race horse says to another, "So, did you bet for or against yourself this time?" "A racing scandal no one suspects." 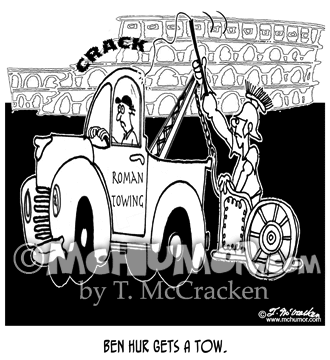 Towing Cartoon 8181: “Ben Hur gets a tow.” Ben Hur in his chariot cracks a whip at the tow truck in front of him. 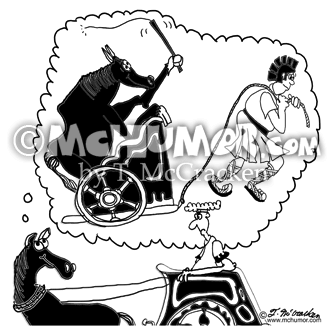 Roman Cartoon 8343: A horse pulling an ancient Roman fantasizes standing in a chariot cracking a whip while a gladiator pulls it. Parking Cartoon 8287: A Roman looking at chariots and horses stacked one each other says, “Parking is always such a problem in this city." Jockey Cartoon 4469: A horse jockey looks at "Track Lighting." Referee Cartoon 6744: Several men stand on a field with black and white striped togas. "Referees at the Original Olympics." Horse Cartoon 2535: A seeing eye dog leads a horse with blinders on. 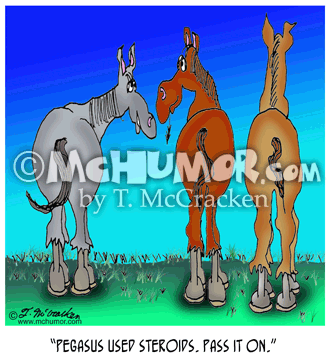 Horse Cartoon 8744: "It's about time horses in equestrian events got the medals." Horses stand on two hooves accepting medals. The one with the gold is gloating and has two hooves clasped in the air above his head.